Bumper budget surplus of S$9.6b for 2017. Higher buyers’ stamp duty on residential properties. GST increase deferred till 2021 or beyond, positive for consumer sector – Buy Genting Singapore. Reiterate positive stance on STI. Favour banks, oil and gas, consumer plays. Singapore ended 2017 with a bumper budget surplus of S$9.6 billion (2.1% of GDP) for FY2017, highest in the last 20 years. The increase was mainly due to exceptional statutory Board contribution (mainly MAS) and boosted by stamp duties from a buoyant property market. With this, the government will dish out SG bonus of between S$100- S$300 each, costing S$700m. In addition, the much anticipated increase in GST from 7% to 9% has been deferred to 2021 and beyond. This should be positive for consumer spending and sentiment. Genting Singapore, which was sold down last week on GST concerns, should see a good rebound. 2018 budget will be expansionary, in particular a S$5b rail infrastructure fund will be set up. Key beneficiary of rail infrastructure projects is ST Engineering, which is a likely contender for the SG-KL high speed rail project. Increase in buyers’ stamp duties from 3% – 4% for residential property purchases could slow en-bloc deals. The impact is small on residential home purchases; we estimate for a S$2.0m property, the effective tax rate is expected to increase by only 0.5 basis points from 2.7% to 3.2%, and is unlikely to affect the affordability of home buyers. However, this could impact en-bloc deals of developers looking to top up their land bank. Extension of wage credit scheme positive for SMEs, consumer companies. The extension of wage credit scheme benefit companies with large workforce within the lower income group – consumer services, oil and gas, construction sectors. This could have a positive impact of 1% to 4% on our forecasts for these consumer companies - HRnet, Sheng Siong, Jumbo Group. Reiterate our positive stance on the market, STI has been resilient and is base building for the next uptrend. We continue to like banks, while expecting rotational interest in oil / gas, SMC and consumer sector to be sustained. 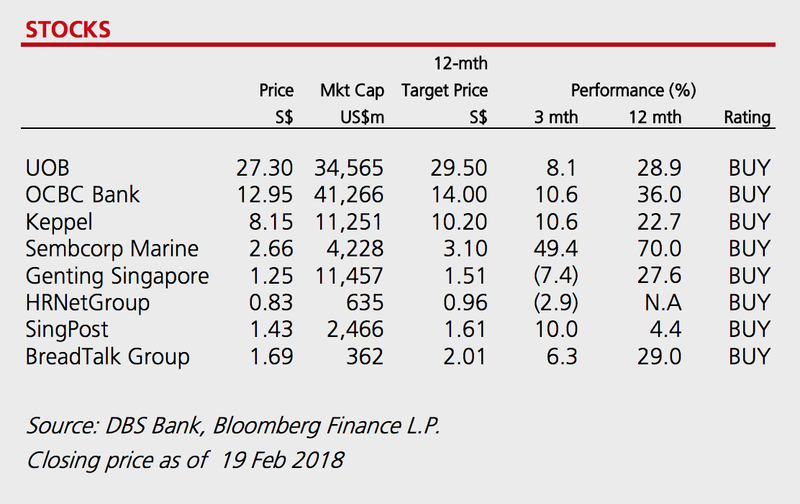 Stock picks : UOB, OCBC, Keppel Corp, SembCorp Marine, Genting Singapore, HRNet, SingPost, Breadtalk. Impact of higher stamp duty for residential market is small. The revised Buyer Stamp Duty rates, up from 3% to 4%, will apply to all residential properties acquired from Tuesday (20th Feb 2018). This will apply to the portion of residential property value in excess of S$1 million. The tweak in the BSD rates aims to make it more progressive in nature by imposing higher taxes on the luxury end of the property market. That said, with the average transaction value for private residential property estimated at c.S$1.5m in 2017, we expect most home buyers will have to pay an additional S$5,000 in taxes, representing a c. 0.3% increase. While higher transaction costs might be seen as mildly negative for the residential market, we do not see this as a deal breaker. In fact, home owners on a budget could potentially look for homes with a lower quantum (i.e.) and thus smaller homes. Based on our estimates, every S$1 million dollars in value above the first S$1 million threshold will raise BSD by S$10,000. For a S$2.0m property, effective tax rate is expected to increase by only 0.5 basis points from 2.7% to 3.2%, and is unlikely to affect the affordability of home buyers. We do note that home buyers who have exercised an option to purchase (OTP) on/before 19th Feb 2018 and exercise it before 12th March 2018 or earlier may apply to the Inland Revenue Authority (IRA) for the old rate to be applied instead. More negative for developers – Land acquisitions momentum to hit a minor road bump. The latest increase in BSD could impact developers looking for en-bloc deals. Developers are facing strong competition for land, leading to razor thin profit margins to land-bank in Singapore. The increase in stamp duties could cause a minor road bump, although the impact is small, considering the large transaction quantum for each site purchased through the government land sales (GLS) and en-bloc market. Amongst the two, we believe that the en-bloc market will be impacted more given the longer time to complete the transaction (if the collective sales did not achieve the 100% approval) which will be a drag on returns and profitability. Recent transactions in the en-bloc market appear to lose some pricing momentum, given that the last 4 deals are transacted through private treaty after an unsuccessful tender. We believe that en-bloc transaction velocity will continue to slow (not stop), subject to the site’s attractiveness. Currently, distributions made by S-REITs to S-REIT ETFs are subject to the corporate tax rate of 17%. However, post the 2018 Singapore budget, the tax transparency which has been applied to individual S-REITs will now be applicable to S-REIT ETFs. Thus, income from the S-REIT ETFs will no longer be taxed at the ETF level but in the hands of the unitholders. The demand for S-REIT ETFs was partially hampered by the lack of tax transparency. With consistent tax treatment now for both SREIT ETFs and individual S-REITs, we believe this will facilitate the flow of capital into S-REIT ETFs for those investors who want an overall S-REIT exposure without having to select individual SREITs. This is an incremental positive for overall S-REIT demand, especially as the S-REIT index has corrected by 8-9% from the highs in January. Phillip SGX APAC Dividend Leaders REIT ETF (AUM of c.S$23m). The Finance Minister has announced the extension of the current Wage Credit Scheme for another three years, up to 2020. This will be at 20% of salary increases, capped at $4,000/ month (and minimum of $50/month) for 2018, and stepped down to 15% and 10% of wage increase in 2019 and 2020, respectively. The Wage Credit Scheme (WCS) was introduced in 2013 to support low wage workers on their salary increases, and at the same time, offset cost increases for companies. During the first phase, the government co-funded 40% of wage increases from 2013 to 2015, and was stepped down to 20% in 2016 and 2017. Arising from the Budget 2018 speech, WCS will be extended at the same rate as per 2016 and 2017. Beneficiaries are companies with large number of low wage workers, in service line. We expect this extension of the WCS to benefit companies with large workforce within the lower income group. 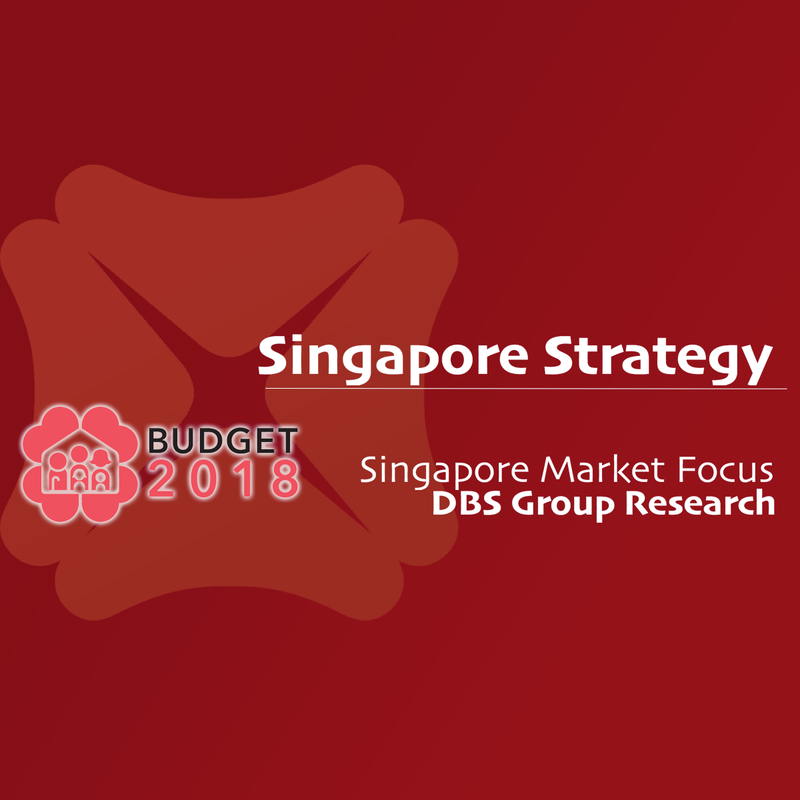 We have earlier expected a reduction of co-funding of the increase by half (ie 10%, from 20% of wage increase in 2018) for consumer service companies such as HRnet, Sheng Siong, Jumbo Group. With this, we estimate this could have a positive impact of ~1% to 4% on our forecasts. Foreign work Levy increases deferred by another year – positive for the marine sector. In view of the cyclical weakness, the foreign worker levy hikes in the marine sector will be deferred by one more year till end-Jun 2019. This brings about cost savings of S$50 and S$100 per basic tier R1 and R2 worker respectively, which levies stay at current S$300 and S$400 respectively. We estimate that the move could save Keppel O&M and Sembcorp Marine S$3-5m respectively in 2017-2018. While this may not be a very significant amount, every bit helps given the challenging operating environment and plunge in profitability. Lowered previously announced carbon tax; Potentially translates to 0.22-0.65 sct increase in electricity tariff. In Budget 2017, government revealed plans to implement the carbon tax between S$10-20 per tonne of greenhouse gases emission from 2019. In the latest Budget 2018, the government has lowered the tax rate to S$5 per tonne in 2019, to be reviewed in 2023, with the intention to gradually increase the tax rate to S$10-15 per tonne by 2030. This will give the industry more time to adjust and implement energy efficiency projects. The carbon tax will generally be applied on upstream, for instance, the power stations and other large direct emitters that produce 25,000 tonnes or more of greenhouse gas emissions in a year rather than electricity users. Based on Energy Market Authority (EMA), Singapore power plants emit approximately 0.43 kg CO2/kW. Taking Sembcorp Industries’ 1.2GW capacity in Singapore as an example, carbon tax payable could total S$15-45m per annum. Assuming full cost pass-through to consumers, consumers might see 0.22 Sct tariff hike in 2019 based on carbon tax rate of S$5 per tonne and up to 0.65 Sct hike by 2030. This represents a small 1.0-3.0% increase from current average household tariff respectively. The impact could be smaller as the large emitters continue to improve energy efficiency. Government is prepared to spend more than S$1 billion in the first five years to support projects that reduce emissions. Higher carbon taxes may have a negative impact on Keppel Infrastructure Trust but we believe that this should be passed on to the offtaker in due course, that being a similar treatment to other variable costs across the KIT assets in Singapore. It is hard to quantify the potential carbon tax as KIT’s carbon emissions are not disclosed.